Cobalt prices continue to rise on the back of increasing demand for electric vehicles. As a result, carmakers and technology companies are looking to secure long-term supply of the metal. Mass production of lithium-ion batteries will be needed to power electric cars, which are forecast to reach 16.5 million in 2025, according to UBS (NYSE:UBS). And as demand for batteries surges, prices for metals such as cobalt are also expected to soar. 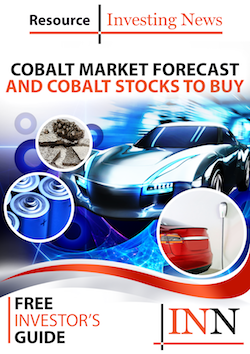 In light of those developments, investors interested in the cobalt space are growing more and more interested in cobalt stocks. To help provide a picture of which cobalt-focused companies are making progress this year, we’ve put together a brief overview of three cobalt stocks on the TSX that have seen share price gains year-on-year. Read on to learn what they’ve been up to in 2018. You can also check out our top cobalt stocks on the TSXV list here. Katanga Mining operates a large-scale copper-cobalt mine complex in the Democratic Republic of Congo through two joint ventures; the joint ventures are called Kamoto Copper Company and DRC Copper and Cobalt Project. Major miner Glencore (LSE:GLEN) increased its interest in Katanga Mining to about 86.33 percent last year. In 2015, the company announced the decision to suspend the processing of copper and cobalt during the construction phase of the whole ore leach project. The suspension continued through most of 2017, and production restarted in December. In January, Katanga announced its ore reserves and mineral resource estimate. It also released its fourth-quarter and year-end production results. Fortune Minerals expects to benefit from the development of its NICO cobalt-gold-bismuth-copper project, located in Canada’s Northwest Territories. The plan is for bulk concentrate from NICO to be shipped to a planned metals processing plant in Saskatchewan. The company is positioned to become a Canadian producer of battery-grade cobalt chemicals with gold and bismuth co-products. On March 27, Fortune Minerals provided an update on its NICO project. On April 2, the company reported the approval of the Tlicho all-season road, which will connect the community of Whati to the territorial highway. Fortune has already received environmental assessment approval to build a 49-kilometer spur road from Whati to its proposed NICO mine. eCobalt Solutions is focused on providing clean cobalt products essential for the rapidly growing rechargeable battery and renewable energy sectors, made safely, responsibly and transparently in the US. eCobalt’s primary asset is its Idaho cobalt project in Lemhi County, Idaho. In January, the company announced the shipment of 3 tonnes of bulk mineralized sample for pilot metallurgical testing to produce clean cobalt concentrate. In February, eCobalt increased the measured and indicated resource estimate for its Idaho project. The company also closed a bought-deal financing for a total of $29.9 million. The data for this article was retrieved on April 5, 2018. Only TSX-listed cobalt companies with market capitalizations greater than $50 million are included. Is there a top-gaining cobalt stock on the TSX that we missed? Tell us in the comments below — and don’t forget to follow us @INN_Resource for real-time news updates! Editorial Disclosure: Fortune Minerals is a client of the Investing News Network. This article is not paid-for content. You obviously are following E-Cobalt Solutions, so why are they not included in your special report on cobalt producers. Their not being tied with the DRC is one of the main interest I AM interested. Please add me to your cobalt mailing, but include work on E-Cobalt Solutions. I think Cobalt is going to be a very hot investment area. Hi Priscila, Lundin Mining sold their share of Tenke in 2016…it is now owned by China Molybdenum. Thank you for pointing that out! We have updated the information for Lundin Mining. Thanks for the info, Lyle! We’ll check out Giga Metals when we put together our list of top-gaining cobalt stocks on the TSXV. Would love to know stocks on nyse exchanges. I was looking at this back in April 2018, and thought it was a brilliant idea. Checking back on all the recommended stocks 8 months later, they’ve all dropped ~50% in value. Perhaps there may be outside reasons for this, but it seems a bit odd that this is true for all the stocks mentioned. What happened to the strategy?